At Summer Camp, Girls Build Sandboxes And Confidence In Their Own Abilities In Portland, Ore., little girls are soldering copper, pouring concrete and running electrical wiring. 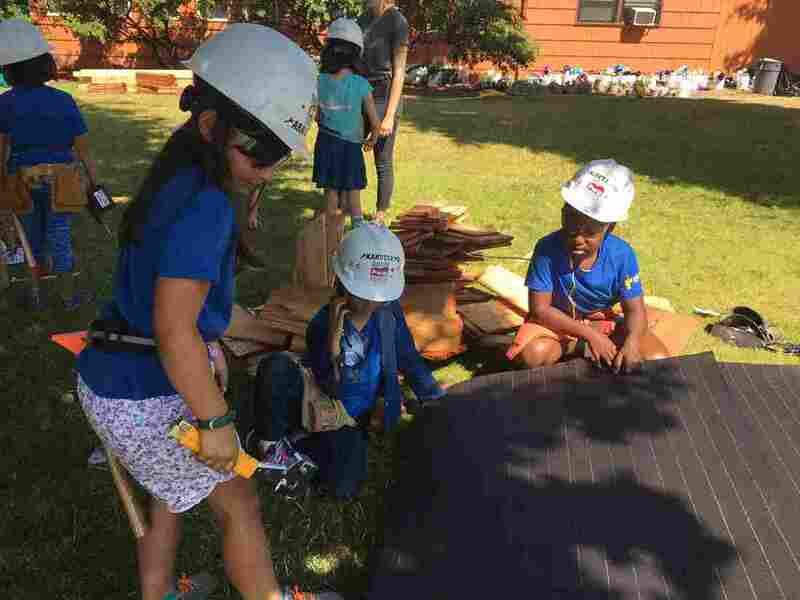 At the Girls Build camp, local tradeswomen teach them the ins and outs of construction. At the Girls Build summer camps in Oregon, Araceli Eide, Kandyce Brown and Aleeyah Coleman learn how to pour concrete, shingle sandbox roofs and use power tools, but instructors say the real skills these young girls gain are increased confidence and fearlessness. The word empowerment gets tossed around a lot when people talk about young girls. But at Girls Build summer camp in Oregon, girls as young as 8 are learning how to use power tools. The camps — held in both Portland and Southern Oregon — are awash in construction excitement. Girls wear hard hats and tool belts wrapped twice around their tiny waists. They're divided up into stations, working on everything from pouring concrete planters to shingling the roof of a sandbox. With every project they're learning they have the power to turn a pile of raw material into an actual structure. "We were just chopping pieces of wood, and we were like — how can this become a huge playhouse?" says 11-year-old Samantha Neville. "Then we painted it, and then it slowly started coming together these past few days. And now, hey, it's looking like something." Katie Hughes, the camp's executive director, says that's the point — girls can produce professional-quality products. "You don't have to make a macaroni necklace, as it turns out," she says. 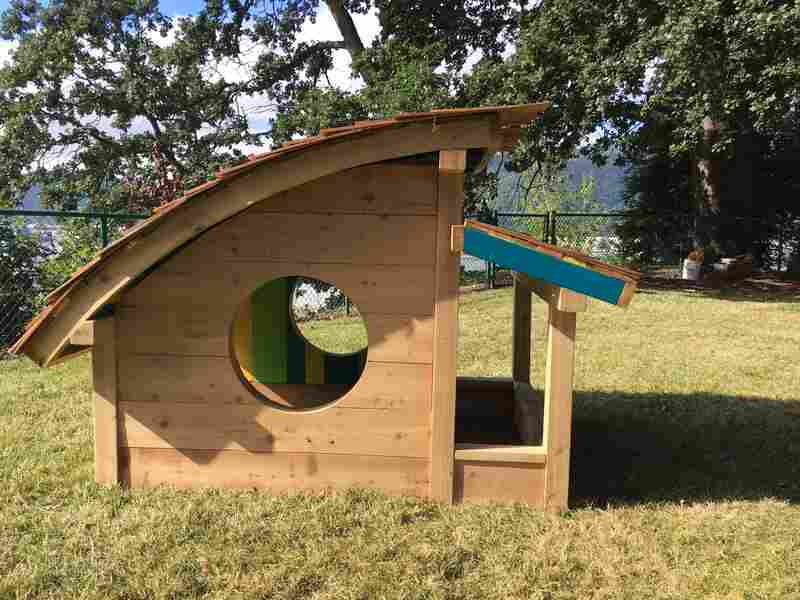 Girls Build summer camps — held in both Portland and Southern Oregon — are awash in construction excitement where girls build structures like this sandbox. Hughes, a carpenter with a degree in social work, grew up honing her building skills in the country. She and her sister made their own fun in the backyard, building their own treehouse and swings, and trying to fix whatever broke around the house. While Hughes would like to see more women in the trades and the gender imbalance even out, she says that more than any future career, it's a sense of mastery and fearlessness the instructors are trying to pass along to the kids. "If something breaks, I want them to want to open that up, and to have the confidence to do it," Hughes says. "That's our mission, inspiring curiosity and confidence in girls through the world of building." Tracy Manaster Alifanz, who sent her 8-year-old twins to Girls Build, says the confidence and fearlessness she sees in her daughters is the biggest change. "There's not nothing they can't do, but there's nothing they can't try," Manaster Alifanz says. "And that's a lot for them to take away in a week." Knowledge like that changes how they see the world built around them. "She doesn't take the solidity and the stuffness of stuff for granted," Manaster Alifanz says of one of her daughters. "There's an appreciation of the actual effort that goes into making the world work." But other parents ask the obvious question — namely, is pairing pre-tweens and power tools a good idea? Hughes stresses that Girls Build is very concerned with safety, and instructors consider girls' ages when pairing them with tools. She says having the youngest girls learn on the jigsaw instead of the chopsaw is just one example of safety precautions they take. But still, there is some worry. When her 9-year-old daughter Aleeyah was showing her around on the camp's final day, Stephanie Hart-Coleman had to hold herself back. "I was like, oh my god — she's about to use this saw. Is she going to lose a finger? And she did wonderful," Hart-Coleman says. "She was happy to be able to show me 'Mom, see, this is what I know. This is what I can do.' She was so proud of herself." For Aleeyah, there was pride in the mastery of these practical skills — skills that many adults are lacking. But it's clearly about so much more than the hammering and sawing. "I like that you can be your own self, and it brings out who you really are," says Aleeyah. "When I build, I get this feeling that I can do anything." These girls are learning that many things in this world can be built, and taken apart, and put back together. They don't have to fit themselves into the designed world — they can build a world that fits them. And that knowledge is a pretty powerful tool to have in their belts.